What is a flexible shape pattern? The very short answer: It’s an external buck that is very easy to make, inexpensive, easy to store, and extremely accurate. The tapes I offer for sale are the finest I have been able to find. They are high quality and if you store your flexible shape patterns in a dry spot they will hold their shape and information for years. 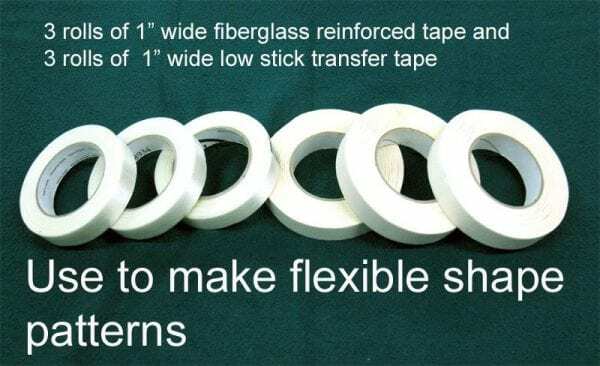 Three rolls of 1″ wide transfer tape and three rolls of 1″ wide filament tape will be enough material to allow you to make flexible shape patterns of say a front and rear fender of a 1930s style car. I have made a video recently of the whole process and I’m hoping my videographer will finish editing it someday… so I can offer it for sale in my Ebay store. I also teach the process at all of my monthly sheet metal shaping classes. See my Ebay sheet metal shaping class ad. In 1999 I was contacted by NH sculptor Jonathan Clowes. He asked me to teach him how to shape aluminum sheet metal so he could continue building a large sculpture commission that he had won. He made several twelve foot long full surface fiberglass forms as bucks. We started making the aluminum panels and I explained to him about an idea I had about making a flexible shape pattern off of a full surface. My idea was to spray on “something” and then peal it off later. I told him how the flexible shape pattern system would work if we could make something that would be easy to do, allow an easy removal, and hold the shape of the surface with no stretching. Jonathan and his helper at the time Mark Goodenough – now also an accomplished copper sculptor- came back the next weekend with the killer idea. They used the two tapes- filament tape and transfer tape to create the first successful flexible shape pattern which we used with my system to create a incredible spiral aluminum sculpture that Jonathan had designed. The system worked perfectly. In 2000 I showed people around the world who loved shaping sheet metal how to make flexible shape patterns when I posted the process on the original Metalshapers forum on Egroups later Yahoo groups.